I enjoy the online game "City of Heroes", as do a number of other equally cool nerds. I've gone so far as to dress as one of my characters for Halloween. I must admit, however, that I create most of my characters to look just like me. I get especially excited when I see someone go the extra mile. These are members of a community site called CoH faces. They've clearly spent a lot of thought and time figuring out how to have a little extra fun with this game. I'm on the fence about the doll. There's a certain creepy factor. Mostly just because dolls can be hyper creepy. 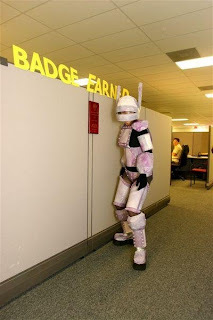 Note that the person dressed in "armor" has a "Badge Earned" message as it would appear on-screen when you earn a badge in the game. The following story begs the question: "How much do you pay for the release of 25 crew members and $100 million in crude oil?" were the coolest thing I've seen all day today... Granted, the day is young. I feel I must mention, I'm not a "Mac Guy" or a "PC Guy" as this article refers to the Ipod. It's a great piece of tech, but it has its flaws. I'm pretty sure this guy's acoustic rig could work for any MP3 player, and probably better than some of the actual commercial stuff out there!